Can you believe Christmas is a little over a month away? 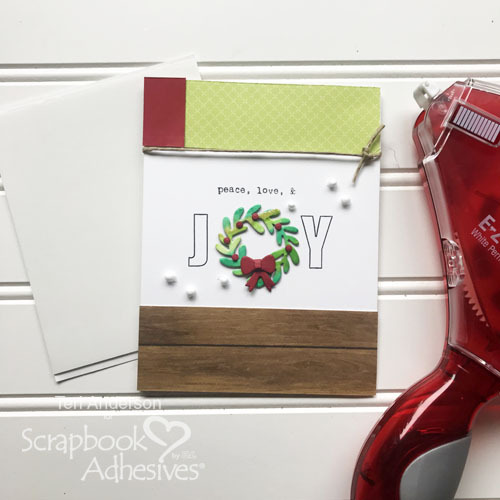 Now it the time to start working on your holiday cards! I’ve got a fun card to share with you today. 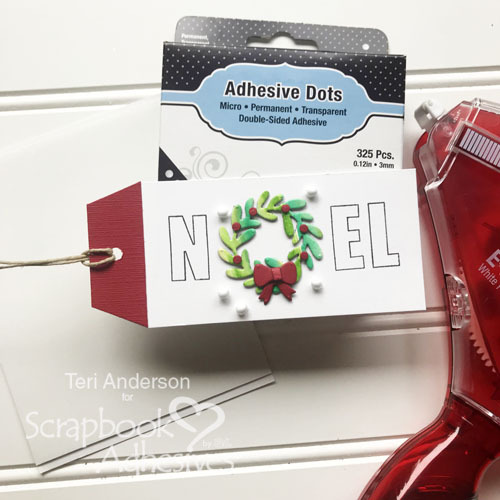 I’ll also give the scoop on how to make a matching gift tag to go with it. 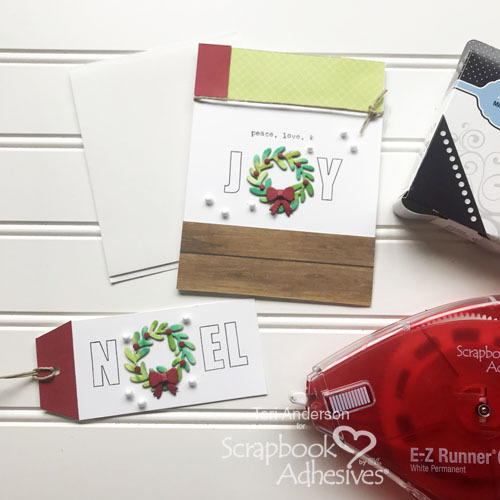 This little ensemble came together quickly and easily with products from Scrapbook Adhesives by 3L. The most time-consuming part of making both the card and tag was creating the wreaths but it adds an impact. I think you will agree. Began by making the green paper I created the wreaths with. It was so easy! I simply brushed watercolor markers onto watercolor paper and then spread the color with a wet paintbrush. Once the panel was dry, I adhered it to one of the 3D Foam Creative Sheets so that I could die-cut the wreaths from it. 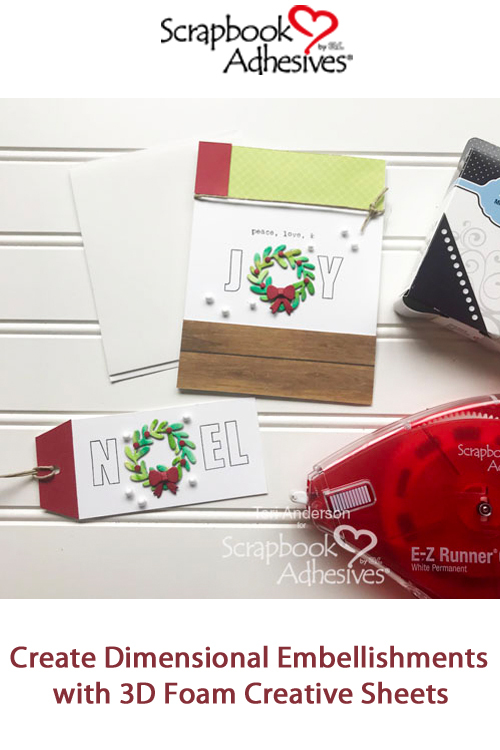 These sheets are perfect for die-cutting elements to use on cards and scrapbook pages as the foam gives die-cuts a little bit of pop. I also adhered some red cardstock to one of the 3D Foam Creative Sheets and die-cut the bow and berries from it. Now, those berries are pretty small. Rather than picking them up with my fingers, I used a paper piercing tool to move them from the sheet to my wreaths. Once I completed my wreaths, I built both the card and the tag around them. To make the wreaths to stand out, I felt the best way was to let one wreath be the “o” in joy and the other be “o” in Noel. Then I simply embellished the card and tag with some additional pieces of paper and twine. I also added some small foam balls that reminded me of snow. I adhered them to the card and tag with some of Adhesive Dots Micro. These dots are perfect for holding small embellishments to cards, scrapbook pages, and tags. I hope you enjoyed checking out this card and tag set! Would love to see your Christmas cards and tags. Please leave a link to your Christmas projects in the comments so I can leave you a little love! This entry was posted in 3D Foam Shapes, Adhesive Dots & Lines, Adhesives, Beginner, Cards, Crafts & Tutorials, E-Z Runner® Grand, Permanent Adhesive, Seasonal Craft Ideas, Skill Level, Winter and tagged 3D Foam Creative Sheets Mix, Adhesive Dots Micro, Card, Card Making, Carta Bella Paper, Christmas, Die-Cutting, Doodlebug Design, E-Z Runner Grand Dispenser, E-Z Runner Grand Permanent Strips Refill, Flora & Fauna, Gift Tag, Holiday, Joy, Kuretake, Lawn Fawn, Noel, Technique Tuesday, Teri Anderson, Watercolors, Wreath. Bookmark the permalink. 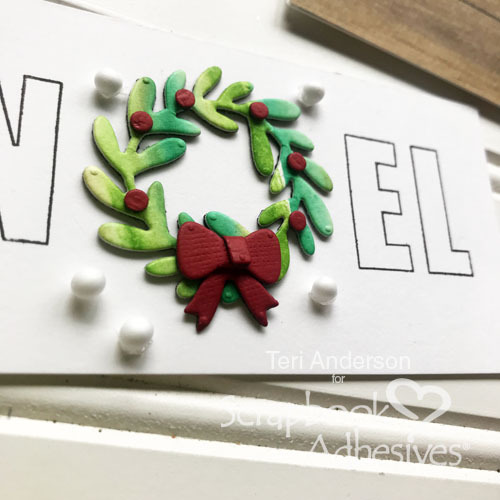 One Response to "Christmas Wreath Card and Gift Tag Set"
Teri, I love these ideas. So simple, clean and fun! Totally swiping this year. Tee hee!